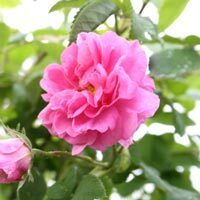 Damask Rose – Essex County Naturals. Regular use will help preserve and maintain a youthful complexion, fade wrinkle lines, soften and smooth rough skin and brighten dull dry complexions. Ideal for mature and damaged skin types. TIP: Use with one of our gentle facial cleansing soaps, purifying beauty muds and hydrating floral water skin tonics to optimize your daily skin care health regimen. Apply a tiny amount each morning and evening to slightly damp or wet freshly cleansed face until absorbed. Keep out of eyes. Use within 4 months of opening. Excess cream on the face may be diluted by simply splashing face with warm water and patting dry.